So it's making you paranoid? .... Awesome. Then it's definitely staying in, I love a good dose of paranoia. The two aliens are intentionally different. - Blue Alien should only give you the hide if you use it with ingenuity, but should give meat if you cut it open, since it's shell is too tough to get the meat without tools. - Brown Aliens don't have the tough shell, so you don't need to get the meat with a knife, but do contain specialised organs for making their electrical attacks. Meanwhile, their meat is poisonous and needs to be cooked. If you tear them open for the sacs, you ruin all the meat, if you cook them, you destroy the sacs. It's Your Call time folks. Working on Sandbag barricades, there are two different ways I could go about this. #1: I can treat them the same way as I treat turrets. - Once deployed, you will be able to use the Z-key to disable them to pick them up and drop them in another place. - They will not be on the player's "side", and will stop the player's bullets accordingly. - To fire past your own barricade, you will need to fire between the sandbags, whilst you can throw grenades "over" them without restriction. Since the computer is a halfwit, they would have sandbags on the same side, and would be able to fire over them, since otherwise they'd tear up their own barricades. But grenades would still bypass these as well. - Turrets probably *will* be able to fire over your barricades. - If they can't do that easily, then as a consolation prize, I can make it that enemies will ignore sandbags, rather than mindlessly attack them and ignore you. Possibly both, though it means more work for me. As an alternative to this, they can just not stop any of the major long range weapon types, which should allow such weapons to fly over them accordingly, but means they offer no protection against ballistics. #2: I can treat them almost the same way as Default does. - Once deployed I'll have to figure out how to use the Z-Key to disable them despite their sharing a side with you. - Your barricade can never be used against you, since it will never stop your bullets and would always stop your enemies. This is slightly easier on the player, since you don't have to worry about positioning. - You'll see "Stand Still, Right Click to Change" every time you mouse over one of them. - Turrets definitely *will not* be able to fire past your barricades. In either case, Wooden Barricades will be walls - these will stop all fire, so they'll be handled like turrets and the field emitter, the Sandbags are unique in that they'll have both enemy and friendly varieties, and possibly allow fire to pass back and forth between them. So yeah, I personally prefer having to position them with gaps, since I think that would be better overall, but I'm happy to go either way, so lemme know and I'll make the code happen. So it's making you paranoid? .... Awesome. Then it's definitely staying in, I love a good dose of paranoia. [quote=postid_406016]If you use your knife with big brown alien corpse it will give you only vulcanic sac but if you drop corpse near fire it will turn to meat. do you think it should be like blue alien (gives you meat and hide)[/quote] The two aliens are intentionally different. - Blue Alien should only give you the hide if you use it with ingenuity, but should give meat if you cut it open, since it's shell is too tough to get the meat without tools. - Brown Aliens don't have the tough shell, so you don't need to get the meat with a knife, but do contain specialised organs for making their electrical attacks. Meanwhile, their meat is poisonous and needs to be cooked. If you tear them open for the sacs, you ruin all the meat, if you cook them, you destroy the sacs. [i]It's Your Call[/i] time folks. Working on Sandbag barricades, there are two different ways I could go about this. #1: I can treat them the same way as I treat turrets. This means that: - Once deployed, you will be able to use the Z-key to disable them to pick them up and drop them in another place. - They will not be on the player's "side", and will stop the player's bullets accordingly. - To fire past your own barricade, you will need to fire between the sandbags, whilst you can throw grenades "over" them without restriction. Since the computer is a halfwit, they would have sandbags on the same side, and would be able to fire over them, since otherwise they'd tear up their own barricades. But grenades would still bypass these as well. - Turrets probably *will* be able to fire over your barricades. - If they can't do that easily, then as a consolation prize, I can make it that enemies will ignore sandbags, rather than mindlessly attack them and ignore you. Possibly both, though it means more work for me. As an alternative to this, they can just not stop any of the major long range weapon types, which should allow such weapons to fly over them accordingly, but means they offer no protection against ballistics. #2: I can treat them almost the same way as Default does. This means that: - Once deployed I'll have to figure out how to use the Z-Key to disable them despite their sharing a side with you. - Your barricade can never be used against you, since it will never stop your bullets and would always stop your enemies. This is slightly easier on the player, since you don't have to worry about positioning. - You'll see "Stand Still, Right Click to Change" every time you mouse over one of them. - Turrets definitely *will not* be able to fire past your barricades. In either case, Wooden Barricades will be walls - these will stop all fire, so they'll be handled like turrets and the field emitter, the Sandbags are unique in that they'll have both enemy and friendly varieties, and possibly allow fire to pass back and forth between them. So yeah, I personally prefer having to position them with gaps, since I think that would be better overall, but I'm happy to go either way, so lemme know and I'll make the code happen. Nope, but Seeds often streak out of the water, or time out and vanish on their own. [quote=postid_400022]i too thought these were reapers i think i actually killed some (if that's even possible? )[/quote] Nope, but Seeds often streak out of the water, or time out and vanish on their own. Can you make them vulnerable when walking over water and actually drop fish when killed (maybe only possible with the spear)? Then they would certainly serve this purpose. Can you make them vulnerable when walking over water and actually drop fish when killed (maybe only possible with the spear)? Then they would certainly serve this purpose. Then they would certainly serve this purpose. I was sort of thinking of including a fishing rod and having a "Fish Seed" that made these splashes. Using the rod near a splash would kill the Seed and catch a fish. I'm thinking the rod would be a weapon that would fire a creature a short distance from the player (like the grenade is a creature). If it died on water, it would drop a buoy marker. The player would then need to stay still (I'd use the Zzzz bar for that, if it was <10 then the buoy marker would be removed) and wait. Fish seeds moving around the water periodically, if they were near the buoy at any point, would die and leave their own, temporary marker, which in turn would destroy the buoy marker and give the player a fish. I'd probably add Tree seeds to that as well, since if they're in the water they're lost anyway. Since there's about five times the amount of food stuffs that the player can eat compared to Default already, this is a low priority, but still a definite possibility for the future. Since there's been no feedback about Sandbags, I'll be making another post shortly brainstorming a little. [quote=postid_393031]Can you make them vulnerable when walking over water and actually drop fish when killed (maybe only possible with the spear)? Then they would certainly serve this purpose. [/quote] I was sort of thinking of including a fishing rod and having a "Fish Seed" that made these splashes. Using the rod near a splash would kill the Seed and catch a fish. I'm thinking the rod would be a weapon that would fire a creature a short distance from the player (like the grenade is a creature). If it died on water, it would drop a buoy marker. The player would then need to stay still (I'd use the Zzzz bar for that, if it was <10 then the buoy marker would be removed) and wait. Fish seeds moving around the water periodically, if they were near the buoy at any point, would die and leave their own, temporary marker, which in turn would destroy the buoy marker and give the player a fish. I'd probably add Tree seeds to that as well, since if they're in the water they're lost anyway. Since there's about five times the amount of food stuffs that the player can eat compared to Default already, this is a low priority, but still a definite possibility for the future. Since there's been no feedback about Sandbags, I'll be making another post shortly brainstorming a little. Sandbags Brainstorm - This is partly for myself, since it's a lot easier to make something when you've written down what you want it to do, but feel free to comment on this. - Sandbags will block all normal weaponfire, regardless of their side. - Turrets will fire a new weapon type, allowing them to bypass sandbags, again, regardless of side. Rare types of Fortified Marine or Robot will use the same weapon type. If I follow through with my idle plans to have a player mountable turret, they will be able to fire past sandbags as well. - Sandbags will be "deactivatable" with Z. If they're destroyed with the Z-key, then they will be redeployable at full strength, regardless of their existing health (this abstracts the player's ability to repair the damage to a bag quite easily so long as the seams have held). They will also be easily repairable with tools and repair kits. - Sandbags will not have a collision effect with creatures - so aliens will be able to run over them to attack the player. The player, meanwhile, will be able to move over the sandbag a little ways so that their gun is on the other side of the bags, allowing them to shoot "over" them. - Sandbags may, depending on how awkward it will be to do so, have an effect that slows movement of creatures near them. This would either involve a weapon specifically targetting any nearby creature and slowing them, or adding a condition check to every creature to see if it's near a sandbag and slow it accordingly. Probably have to be the latter, despite how nightmarish it is to achieve. This would still allow creatures to climb over them, but would enforce a limitation on their ability to bypass them. In contrast - Walls will stop all weapons fire and not be bypassable by any weapons (again, the player could shoot between cracks that they left themselves). Turrets will be able to bypass wooden walls as well, making them an excellent option when fortified, for and against the player. For both structures, there will be weapons available that will bypass fortifications - Flamers, plasma sprays and grenades will all have various methods of bypassing barriers to harm the juicy contents. Wooden walls may also be set on fire, which would be very, very bad for you if it happened to be your fort. This would bypass their health, so you couldn't just repair through the damage. A Sandbag would make a soft "doorway" type barrier to a potential player fortification. It would be a decent defence against Marines and other ranged opposition. If I don't have it slow down creatures, then the player will still be able to secure the front of a sandbag wall with Snares to temporarily immobilise approaching creatures. Most Creatures would ignore them, but would still potentially damage them either shooting at you or your turrets. Wooden walls would be the main structural components of a potential fortification, with higher health and defences than the sandbag against most things. Again, creatures would ignore them, but would usually end up hitting them trying to get to you or your structures. I may add metal walls as well, these would be toughest of all, but require the most valuable, hard to acquire material of them all. The player's capacity to easily create kill-zones with investment into combinations of sandbags, walls and turrets is limited by the fact that turrets of all kinds will have limited resources that the player will have to restock or circumvent. An unguarded fortress may survive without turret defenders for awhile, but it will eventually fall. So yeah, these are the defensive aspects I'm planning to be working on this version. Any suggestions or comments? Sandbags Brainstorm - This is partly for myself, since it's a lot easier to make something when you've written down what you want it to do, but feel free to comment on this. - Sandbags will block all normal weaponfire, regardless of their side. - Turrets will fire a new weapon type, allowing them to bypass sandbags, again, regardless of side. Rare types of Fortified Marine or Robot will use the same weapon type. If I follow through with my idle plans to have a player mountable turret, they will be able to fire past sandbags as well. - Sandbags will be "deactivatable" with Z. If they're destroyed with the Z-key, then they will be redeployable at full strength, regardless of their existing health (this abstracts the player's ability to repair the damage to a bag quite easily so long as the seams have held). They will also be easily repairable with tools and repair kits. - Sandbags will not have a collision effect with creatures - so aliens will be able to run over them to attack the player. The player, meanwhile, will be able to move over the sandbag a little ways so that their gun is on the other side of the bags, allowing them to shoot "over" them. - Sandbags may, depending on how awkward it will be to do so, have an effect that slows movement of creatures near them. This would either involve a weapon specifically targetting any nearby creature and slowing them, or adding a condition check to every creature to see if it's near a sandbag and slow it accordingly. Probably have to be the latter, despite how nightmarish it is to achieve. This would still allow creatures to climb over them, but would enforce a limitation on their ability to bypass them. In contrast - Walls will stop all weapons fire and not be bypassable by any weapons (again, the player could shoot between cracks that they left themselves). Turrets will be able to bypass wooden walls as well, making them an excellent option when fortified, for and against the player. For both structures, there will be weapons available that will bypass fortifications - Flamers, plasma sprays and grenades will all have various methods of bypassing barriers to harm the juicy contents. Wooden walls may also be set on fire, which would be very, very bad for you if it happened to be your fort. This would bypass their health, so you couldn't just repair through the damage. The net of this would be: A Sandbag would make a soft "doorway" type barrier to a potential player fortification. It would be a decent defence against Marines and other ranged opposition. If I don't have it slow down creatures, then the player will still be able to secure the front of a sandbag wall with Snares to temporarily immobilise approaching creatures. Most Creatures would ignore them, but would still potentially damage them either shooting at you or your turrets. Wooden walls would be the main structural components of a potential fortification, with higher health and defences than the sandbag against most things. Again, creatures would ignore them, but would usually end up hitting them trying to get to you or your structures. I may add metal walls as well, these would be toughest of all, but require the most valuable, hard to acquire material of them all. The player's capacity to easily create kill-zones with investment into combinations of sandbags, walls and turrets is limited by the fact that turrets of all kinds will have limited resources that the player will have to restock or circumvent. An unguarded fortress may survive without turret defenders for awhile, but it will eventually fall. So yeah, these are the defensive aspects I'm planning to be working on this version. Any suggestions or comments? I think you will somehow need to add a good visual cue to any object able to shoot over sandbags. I can understand the turrets as they may have a certain height, but other human soldiers would certainly need to be pretty tall or flying. I think you will somehow need to add a good visual cue to any object able to shoot over sandbags. I can understand the turrets as they may have a certain height, but other human soldiers would certainly need to be pretty tall or flying. I can understand the turrets as they may have a certain height, but other human soldiers would certainly need to be pretty tall or flying. 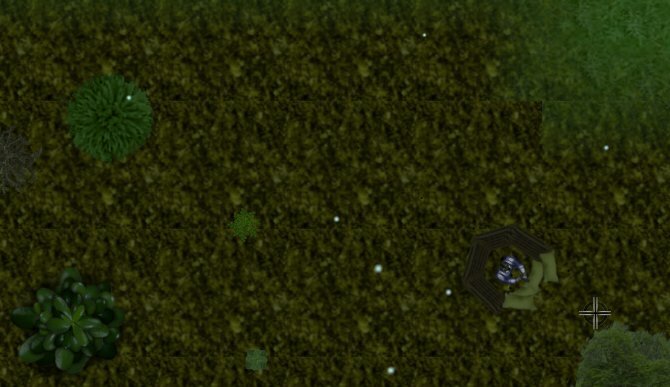 Good point - These soldiers would probably be stationary, turret mounted defenders themselves, or snipers, with a unique sprite to denote their snipery-ness. It's going to be fairly rare however, most of the turrets and fortifications in-game are going to be the player's after all, and I fully expect players to destroy most other fortifications in short order. [quote=postid_401023]I think you will somehow need to add a good visual cue to any object able to shoot over sandbags. I can understand the turrets as they may have a certain height, but other human soldiers would certainly need to be pretty tall or flying. [/quote] Good point - These soldiers would probably be stationary, turret mounted defenders themselves, or snipers, with a unique sprite to denote their snipery-ness. It's going to be fairly rare however, most of the turrets and fortifications in-game are going to be the player's after all, and I fully expect players to destroy most other fortifications in short order. Hmm I think just not blocking any bullets while blocking movement might be fine but blocking only bullets is interesting too. Hmm I think just not blocking any bullets while blocking movement might be fine but blocking only bullets is interesting too. Hmm I think just not blocking any bullets while blocking movement might be fine but blocking only bullets is interesting too. Alright, I've done the necessary checks, and I can, as I thought, allow bullets to pass through it by making it 100% immune to the weapon type. So yes, I could have Sandbags fail to stop bullets/lasers/plasma bolts/arrows and all the other ranged weapons whilst stopping all melee weapons, so it can be destroyed with melee and ignored by ranged. As an alternative, this could also be handled with Metal Walls being Fences, which operated in this way, stopping movement and melee, but not bullets. Sandbags: Stop Bullets, not movement, and hence not melee. Palisades (wooden walls): Stop everything, but vulnerable to certain common weapon types. Chain Fences: Stop movement and melee, not bullets. This would mean the best defensive structure would probably be Electric Fences (retaliate against melee attacks when struck), with a Sandbag barricade behind it to block gunfire, whilst wooden walls would be the cheapest, simplest wall available. Alright, I've done the necessary checks, and I can, as I thought, allow bullets to pass through it by making it 100% immune to the weapon type. So yes, I could have Sandbags fail to stop bullets/lasers/plasma bolts/arrows and all the other ranged weapons whilst stopping all melee weapons, so it can be destroyed with melee and ignored by ranged. As an alternative, this could also be handled with Metal Walls being Fences, which operated in this way, stopping movement and melee, but not bullets. So this alternative system would be: Sandbags: Stop Bullets, not movement, and hence not melee. Palisades (wooden walls): Stop everything, but vulnerable to certain common weapon types. Chain Fences: Stop movement and melee, not bullets. This would mean the best defensive structure would probably be Electric Fences (retaliate against melee attacks when struck), with a Sandbag barricade behind it to block gunfire, whilst wooden walls would be the cheapest, simplest wall available. Hey Venom, good to see you're still around. Yeah, filedropper's just for the temporary stuff, since my permanent hosting's not unlimited right now. It's the most recent one too, though you'll have to fix up my testing numbers (or get used to sleeping instantly after you start the game). Hey Venom, good to see you're still around. :) Yeah, filedropper's just for the temporary stuff, since my permanent hosting's not unlimited right now. Try.... This one, it should still work: http://www.filedropper.com/fm-031b It's the most recent one too, though you'll have to fix up my testing numbers (or get used to sleeping instantly after you start the game). You're a gent, thanks Harwe. I'll send you a pm next time I come out with a stable version so you don't have to scour around the thread for links. Since there's apparently not much opinion either way, I guess I'll go with the alternative system in my post before last, so the player has the option of any of the three varieties to go with. If that works out unpopular then I can always change it at a later date. I should hopefully have the four barriers, and maybe the Robinson traps set up over the weekend, pending any unexpected sidetracking. Update: Sandbags now have a "soft" block system for movement by dropping an invisible "ghost" that must be pushed past to cross them. Whilst the player is sat on top of the wall, these blockers are disabled, allowing them to rapidly descend in either direction. Sandbags can now be disabled if they're "friendly", and I've tidied up the whole system to make deactivating turret systems tidier. Since Sandbags are unlikely to have specific systems safeguarding the fact that they're piled into a wall, you'll probably be able to collect any set of sandbags, provided you're happy eating fire from anyone on the other side whilst you do dismantle them. You're a gent, thanks Harwe. I'll send you a pm next time I come out with a stable version so you don't have to scour around the thread for links. Since there's apparently not much opinion either way, I guess I'll go with the alternative system in my post before last, so the player has the option of any of the three varieties to go with. If that works out unpopular then I can always change it at a later date. I should hopefully have the four barriers, and maybe the Robinson traps set up over the weekend, pending any unexpected sidetracking. Update: Sandbags now have a "soft" block system for movement by dropping an invisible "ghost" that must be pushed past to cross them. Whilst the player is sat on top of the wall, these blockers are disabled, allowing them to rapidly descend in either direction. Sandbags can now be disabled if they're "friendly", and I've tidied up the whole system to make deactivating turret systems tidier. Since Sandbags are unlikely to have specific systems safeguarding the fact that they're piled into a wall, you'll probably be able to collect any set of sandbags, provided you're happy eating fire from anyone on the other side whilst you do dismantle them. Wow. I just want to say great job to TNN17. I just recently found my copy of Notrium and spent the past two hours searching for any recently updated mods for it. I'm really happy that there is still someone willing to mod Notrium, and that they're actually having fun with it. Thanks. Wow. I just want to say great job to TNN17. I just recently found my copy of Notrium and spent the past two hours searching for any recently updated mods for it. I'm really happy that there is still someone willing to mod Notrium, and that they're actually having fun with it. Thanks. Thanks Mageking, the more backup places, the more likely it is I can find my data again if I accidentally lose everything. Again. You're very welcome Sxythe, always good to see new faces in the Notrium playing community. Be sure to speak up if you've any bug reports, suggestions or feedback. Update: Sandbags tweaked to be slightly less movement interfering, and smaller, so they won't jog the player's aim whilst he's standing on them. Walls mostly coded, and currently being worked on. Some major-ish bugs with sleep (which prevented sleep for about a minute after a sudden and unexpected wake-up, and rarely stuck the player unable to open their inventory for the same time period) are now fixed, and sleep speeded up to 10x gamespeed from x5, making your eight hours fly by twice as fast. Wall and fence graphics created, wall and fence "corpse" plot object graphics done, and I still hate graphics work. Fences will be from Scrap Metal combined together like Wood or String. Sidenote: Now that breaking a branch is as easy as smashing it against a tree until it snaps into Kindling, does anyone mind if I remove the secondary use from it? Thanks Mageking, the more backup places, the more likely it is I can find my data again if I accidentally lose everything. Again. You're very welcome Sxythe, always good to see new faces in the Notrium playing community. Be sure to speak up if you've any bug reports, suggestions or feedback. Update: Sandbags tweaked to be slightly less movement interfering, and smaller, so they won't jog the player's aim whilst he's standing on them. Walls mostly coded, and currently being worked on. Some major-ish bugs with sleep (which prevented sleep for about a minute after a sudden and unexpected wake-up, and rarely stuck the player unable to open their inventory for the same time period) are now fixed, and sleep speeded up to 10x gamespeed from x5, making your eight hours fly by twice as fast. Wall and fence graphics created, wall and fence "corpse" plot object graphics done, and I still hate graphics work. Fences will be from Scrap Metal combined together like Wood or String. Sidenote: Now that breaking a branch is as easy as smashing it against a tree until it snaps into Kindling, does anyone mind if I remove the secondary use from it? Secondary use? If it's using it as a weapon then I don't mind. Secondary use? If it's using it as a weapon then I don't mind. Secondary use? If it's using it as a weapon then I don't mind. Secondary use in this case would be L to break it, since you could do that yourself by wielding it and smashing it into something. though if you really want rid of the club weapon instead, I suppose I could oblige. [quote=postid_424003]Secondary use? If it's using it as a weapon then I don't mind. [/quote] Secondary use in this case would be L to break it, since you could do that yourself by wielding it and smashing it into something. though if you really want rid of the club weapon instead, I suppose I could oblige. If it didn't break all the time the club might be fine(although I think I've used it like once or twice at most so I'm not exactly expert on the subject) but as it is I just find it useless and having to wield it to get kindling sounds different and possibly annoying but it might be fine since mostly I'm against it just because it would mean doing things differently to how I'm used to. If it didn't break all the time the club might be fine(although I think I've used it like once or twice at most so I'm not exactly expert on the subject) but as it is I just find it useless and having to wield it to get kindling sounds different and possibly annoying but it might be fine since mostly I'm against it just because it would mean doing things differently to how I'm used to. Noted. I personally use the club only at the beginning of the game myself (it's better than punch against the starting alien rush). Removing it just means more flavour text about how it's inappropriate to wield. Alternatively I could just lower the breakage chance a bit to make it a more viable early-game weapon and just leave it as is. Anyone else have an opinion on this? Noted. I personally use the club only at the beginning of the game myself (it's better than punch against the starting alien rush). Removing it just means more flavour text about how it's inappropriate to wield. Alternatively I could just lower the breakage chance a bit to make it a more viable early-game weapon and just leave it as is. Anyone else have an opinion on this? And now updates in Haiku. Yet more bugs with sleep resolved. Made an awesome fort. [img]http://fc08.deviantart.net/fs71/f/2012/107/e/5/barricades_up__by_horizonedge-d4wj6bz.jpg[/img] And now updates in Haiku. Barricades finished. Yet more bugs with sleep resolved. Made an awesome fort. I need to get Notrium installed in PlayOnLinux. Storage Lockers for the V'E. Slingshots - Mass Driver and Powered Accelerators. Sling + Driver: Slow, but deal decent damage with pebbles. And redo the wreckage loot system. That's going to be awhile, probably at least three or four weeks with the graphics, since I've a lot of other things to do to prepare for the birth of my son in September. Glad you got it working at least Anonymous, lemme know how you like it! Update: Fencing and new metal graphics done. Still hating it. Scrap Metal will now be combinable into Metal. Where Scrap can be used for personal scale items, Metal will have grander purposes, a major one of which is fencing. I can assure you that there won't be many updates in awhile MK, I still have to squeeze into 0.32: Turrets Snares Wire Fencing Ether Generators Storage Lockers for the V'E. New Nests. Slingshots - Mass Driver and Powered Accelerators. Sling + Driver: Slow, but deal decent damage with pebbles. Android Weapon Mods. And redo the wreckage loot system. That's going to be awhile, probably at least three or four weeks with the graphics, since I've a lot of other things to do to prepare for the birth of my son in September. Glad you got it working at least Anonymous, lemme know how you like it! Update: Fencing and new metal graphics done. Still hating it. Scrap Metal will now be combinable into Metal. Where Scrap can be used for personal scale items, Metal will have grander purposes, a major one of which is fencing. That's how long my first run was. In other news, the game extracted into folders called "Data" and "Textures", which did NOT automatically merge with "data" and "textures" because Linux is case-sensitive. I'd comment on bugs in the actual game, but... Well, you know. 45 seconds. That's how long my first run was. I don't want to talk about it. In other news, the game extracted into folders called "Data" and "Textures", which did NOT automatically merge with "data" and "textures" because Linux is case-sensitive. I'd comment on bugs in the actual game, but... Well, you know. In other news, the game extracted into folders called "Data" and "Textures", which did NOT automatically merge with "data" and "textures" because Linux is case-sensitive. I'd comment on bugs in the actual game, but... Well, you know. Orally? I guess I'll go for a data/textures folder next time for you, thanks for the heads up. Have you tried running away like a little girl at the beginning? I do, and it works rather well on the whole survival front. [quote=postid_445001]45 seconds. That's how long my first run was. I don't want to talk about it. In other news, the game extracted into folders called "Data" and "Textures", which did NOT automatically merge with "data" and "textures" because Linux is case-sensitive. I'd comment on bugs in the actual game, but... Well, you know. [/quote] Orally? I guess I'll go for a data/textures folder next time for you, thanks for the heads up. Have you tried running away like a little girl at the beginning? I do, and it works rather well on the whole survival front. I believe I have suffered a horrible, grim, bee-based death. I was having a very good second run (In absolute measures, not just compared to my first run) when I suddenly and fatally realized that there was NOT, in fact, a glitched bar on the screen, but that there is a need to drink as well as eat. How do I drink? I was having a very good second run (In absolute measures, not just compared to my first run) when I suddenly and fatally realized that there was NOT, in fact, a glitched bar on the screen, but that there is a need to drink as well as eat. How do I drink? I die to bees all the time, especially because I'm greedier than Winnie the Pooh when it comes to that honey. Have you tried swimming out of their killzones? Yeah, Thirst is a whole lot nastier than Hunger, you could probably survive a few months with no food, but you'll die rapidly if you don't keep your fluids up. Eating. < Most foodstuffs, others make you thirstier. Using an empty cannister over water, then drinking from it. < Most of the things you can make with cannisters of water also increase thirst by a healthy amount. And just in case - you can also cook items by dropping them adjacent to a fire. Including heating up water. Out of curiosity, how many people are using the difficulty modes right now? They should be implemented and I was interested if there was an appreciable difference in them. I die to bees all the time, especially because I'm greedier than Winnie the Pooh when it comes to that honey. Have you tried swimming out of their killzones? Yeah, Thirst is a whole lot nastier than Hunger, you could probably survive a few months with no food, but you'll die rapidly if you don't keep your fluids up. You can drink by: Walking over water. Standing in water. Eating. < Most foodstuffs, others make you thirstier. Using an empty cannister over water, then drinking from it. < Most of the things you can make with cannisters of water also increase thirst by a healthy amount. And just in case - you can also cook items by dropping them adjacent to a fire. Including heating up water. Out of curiosity, how many people are using the difficulty modes right now? They should be implemented and I was interested if there was an appreciable difference in them. Edit: In default Notrium, I had constant problems with overheating but rarely had any problems with freezing. In this game, once I start freezing, I'm guaranteed to die no matter how long I hold on. I ran out of tinder. My weight limit and max health fell to ridiculously low levels as I froze to death, and I still managed to rebound by taking advantage of the Var'Equinallin wreck and my blanket. Then I got thirsty, ran outside for a glass of water, and died of hypothermia anyways. Lunch-break Update: Fences done, Electric Fences just need their Melee Range auto-counter and they're done too. This was a surprisingly tedious little exercise. Since Fences are inherently immune to guns and most ranged attacks (they pass through unhindered), it's a little tricky to actually break one with them. Welding Torches (and technically flamers) will work, as will melee or explosives, but bear that in mind next time you want to break into a fenced in area. Hypothermia is deadly, but I think that your problem may actually be with the ship's graveyard, which is currently set to "Arctic Winter" levels of night-time temperature. I'll fix that one when I get out of work and halve the loss. - Remember you can punch or swing melee weapons to increase your temperature, even if you have no fatigue left. This can actually help bring your temperature out of the shiverzone, at which point you'll regain heat much faster. - Remember that hypothermia is a combination of fatigue and cold. If you're not tired, you won't contract it. Since swimming lowers your temperature and saps your fatigue quite quickly, try to avoid it at night. - Keep your fluids up, drink hot drinks to increase your core temperature, and remember that Stasis Fields naturally regulate their internal temperature. - Yellow Plants are natural stimulants, providing your body with a large amount of stamina - if you can avoid their side effects at least. - Four Herb Mixes burn forever. - If in doubt, set a tree on fire. I just played a complete (Non-dying..?) round of FM, and I've reached a point where I can't do anything else. I emptied out every single shipwreck in the world and never found a power coupling, so I couldn't play with technology. I was carrying four sets of tools and a blowtorch, and it keeps giving me fuel cells and batteries but no power couplings. Sometimes when I sleep, I'll only recover 50 or 75 Sleep and stop, or not recover any sleep at all and drop to zero. Once I've caught hypothermia, I never seem to drop below two units/dummy inventory items of hypothermia ever again. Even if I'm well rested, not tired, and standing in a forest fire catching a fever. Speaking of fevers, I have no idea what happens when you get too hot, 'cause I never have. It's A LOT easier to cool down than heat up. Bad weather in the ship graveyard is so common that I just gave up and went without battery power. Not that I needed it, 'cause I never found a damned power coupling. ... Wait, you can set herb mixes on fire? Is that what dumping them out is for? I never tried it. Speaking of the Var'Equinallin, it's currently useless. I tried hitting everything in the ship with tools, thinking I might wake a computer by hitting a special creature or something, but there isn't anything to do in there except keep warm. It'd be kinda cool if it was a guaranteed source of, oh, you know, POWER COUPLINGS or something. I just played a complete (Non-dying..?) round of FM, and I've reached a point where I can't do anything else. I emptied out every single shipwreck in the world and never found a power coupling, so I couldn't play with technology. I was carrying four sets of tools and a blowtorch, and it keeps giving me fuel cells and batteries but no power couplings. Sometimes when I sleep, I'll only recover 50 or 75 Sleep and stop, or not recover any sleep at all and drop to zero. Once I've caught hypothermia, I never seem to drop below two units/dummy inventory items of hypothermia ever again. Even if I'm well rested, not tired, and standing in a forest fire catching a fever. Speaking of fevers, I have no idea what happens when you get too hot, 'cause I never have. It's A LOT easier to cool down than heat up. Bad weather in the ship graveyard is so common that I just gave up and went without battery power. Not that I needed it, 'cause I never found a damned power coupling. I built a tazer once in my last game. Never used it, ended up taking it apart to recharge my batteries and make a flashlight 'cause I blacked out in the Var'Equinallin and thought it was naturally dark. (That was before I died.) ... Wait, you can set herb mixes on fire? Is that what dumping them out is for? I never tried it. Speaking of the Var'Equinallin, it's currently useless. I tried hitting everything in the ship with tools, thinking I might wake a computer by hitting a special creature or something, but there isn't anything to do in there except keep warm. It'd be kinda cool if it was a guaranteed source of, oh, you know, POWER COUPLINGS or something. Oh ouch, sounds like the RNG shafted you pretty hard. You must have been able to pull off a pretty successful Robinson to conquer the whole Graveyard though. What were your most useful items in a techless run? - Sleep bugs already fixed and coming this version. - The V'E will have some storage lockers added to it this version. I'll also add a single coupling for the moment, since I hear they're uncommon. - I think I've now located the hypothermia bug, it should correctly remove all informational items now. Failing this I'll add a conditional script and give it a looping use-script to remove itself if you have no hypothermia symptom tokens left. - The Ship Graveyard is an end-game area, it's supposed to be horrible for tech-monkeys, since it's also a guaranteed source of a huge amounts of tech. If you did have energy couplings, most things you'd make with them would have been disabled anyway. - I've now tweaked climates a little to bring things more in line with what they should be. I may need to work on it more though. Also tweaked fires to make them a little hotter, keep an eye out next update and lemme know what you think. If you want to roast, try standing next to the multiple fires in the beginning, you'll overheat soon enough. It's a lot harder to suffer from long term hyperthermia at the moment however, since water is so plentiful and unlike in Default, you will actually sweat when you get to about +40, maintaining your temperature accordingly (since you naturally gained heat in Default by moving and by being out of the shade but never lost it, that's why overheating happened so much). Comparatively, it's pretty easy to trigger Hypothermia - Shivering lowers your stamina (again, keeping your temperature at around -40), running around without resting lowers your stamina, being sleepy lowers your stamina.... And you're right, it's a lot harder to restore heat than it is to lose it, which is why exposure is a serious issue. When there's a Desert area and plains with no water sources available, Hyperthermia will be a much more common occurence. Herb Mixes have various effects when Y'd, most of which exist to easily recover the cannister. Normal Water: Cool yourself down. Hot Water: Heat yourself up. Red Tea: Heal some wounds. Medicinal Paste: Serious wound recovery. Four Herb Mix: A self-sustaining exothermic reaction. - Edit: Oh that reminds me, you did at least get a lot of use out of grenades finding all those batteries, right? Oh ouch, sounds like the RNG shafted you pretty hard. You must have been able to pull off a pretty successful Robinson to conquer the whole Graveyard though. What were your most useful items in a techless run? - Sleep bugs already fixed and coming this version. - The V'E will have some storage lockers added to it this version. I'll also add a single coupling for the moment, since I hear they're uncommon. - I think I've now located the hypothermia bug, it should correctly remove all informational items now. Failing this I'll add a conditional script and give it a looping use-script to remove itself if you have no hypothermia symptom tokens left. - The Ship Graveyard is an end-game area, it's supposed to be horrible for tech-monkeys, since it's also a guaranteed source of a huge amounts of tech. If you did have energy couplings, most things you'd make with them would have been disabled anyway. - I've now tweaked climates a little to bring things more in line with what they should be. I may need to work on it more though. Also tweaked fires to make them a little hotter, keep an eye out next update and lemme know what you think. If you want to roast, try standing next to the multiple fires in the beginning, you'll overheat soon enough. It's a lot harder to suffer from long term hyperthermia at the moment however, since water is so plentiful and unlike in Default, you will actually sweat when you get to about +40, maintaining your temperature accordingly (since you naturally gained heat in Default by moving and by being out of the shade but never lost it, that's why overheating happened so much). Comparatively, it's pretty easy to trigger Hypothermia - Shivering lowers your stamina (again, keeping your temperature at around -40), running around without resting lowers your stamina, being sleepy lowers your stamina.... And you're right, it's a lot harder to restore heat than it is to lose it, which is why exposure is a serious issue. When there's a Desert area and plains with no water sources available, Hyperthermia will be a much more common occurence. Herb Mixes have various effects when Y'd, most of which exist to easily recover the cannister. Normal Water: Cool yourself down. Hot Water: Heat yourself up. Red Tea: Heal some wounds. Medicinal Paste: Serious wound recovery. Four Herb Mix: A self-sustaining exothermic reaction. - Edit: Oh that reminds me, you did at least get a lot of use out of grenades finding all those batteries, right?